The Nathpa Jhakri Hydro-electric project, located in Kinnaur and Shimla districts of Himachal Pradesh, is a run-off the river type development, proposed to harness hydroelectric potential of the upper reaches of the river Sultej, the project proposed to generate about 1500 MW, is one of the biggest underground ventures in the world. Figure gives schematic diagram of the project layout. The Nathpa-Jhakri power corporation was incorporated on 24th May 1988 as a joint venture of the Government of India and Government of Himachal Pradesh. The economic hydropower potential of Himachal Pradesh has been assessed as more than 20,000 MW of installed capacity. The potential developed so far is only about 3000 MW (15%) while 1200 MW (6%) is under development. River Sutlej has the pre-eminence of hydropower potential of over 9350 MW, of which only 1330 MW (14%) has so far been harnessed. Dam down stream of Wangu bridge of Nathpa and power house near Jhakri Village on left bank of river satluj. Catchment area of river Satluj at Dam site. 2 counter weight balanced gates each of size 7.5 mx2.5 m.
Four parallel chambers ach 525 m long, 63 m wide at the centre and 27.5m deep. Particles greater than 0.2 mm. Across sholding khad at El. 1544.53 m.
Varies from 4.625 m to 2m. 0.82 m to 3.82 m.
Underground desilting chamber of 56 m x 10.15 m and debris choking hopper of 12.5 m x 10.15 m size. Restricted Entry through connecting shaft. 21 m circular for height of about 225 m and a connecting shaft of 8.8 m dia and about 71 m high and a pond of 5 m height and 6000 m2 area at top. 12 m D-Shaped, 200 m long at El. 1370. 3, each bifurcating to feed 2 units. 4.9 m and approx 633 m length of each pressure shaft. 3.45 m, and approx. 56 m length for each pressure shaft. 198 m x 18 m x 27.5 m.
Number of capacity of generating units. Energy generation in a dependable year. The Nathpa dam which is a concrete gravity dam proposed to be of 60.5 m height is expected to divert 486 cumecs of water to the intake structure on the left bank comprising four intakes. Each intakes are provided with independent trash rack with trash racking machine located at the platform provided above F.R.L. to facilitate cleaning of rocks. The intake structure leads to the four disilting chambers through an independent shaft with vertical life gate to control the flow of water. A continuous skimmer wall top at El. 1468.73 m extending upto dam, also has been proposed in front of all the four intakes to restrict the entry of sediments into the intake pool. The underground desilting complex meant to exclude sediment particles above. 2 mm to enter the headrace runnel (H.R.T.) is the largest underground complex in the world. Each chamber is provided with a 3 m wide collection trench in the center running along its length. The hopper portion of the chamber slopes towards this trench. The sediments from the collection trench are expected to flow down to the flushing conduit running below this trench and finally dump into the river through a main flushing tunnel. This cleaned water is then fed to the H.R.T., which is proposed to be of 10.15 m diameter and circular in cross section. The HRT, which is 27295 m long runs from Nathpa to Jhakri and is one of the world's largest power tunnels. This power tunnel is connected to the penstock through a main surge shaft to control the excess pressure of water. The surge shaft located at the intake of the penstocks has a 21 m diameter and is a vertical opening of 225 m height and also happens to be the deepest surge shaft in the world. 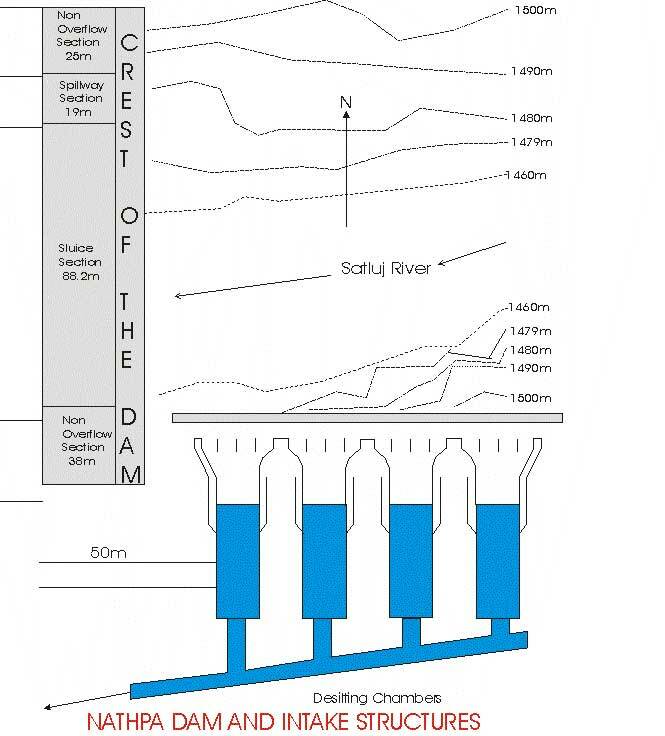 The penstock comprising three pressure shafts of diameter 4.9 m and length varying from 619 m to about 660 m would take off from the surge shaft at an angle of 450 to the horizontal. These would be lined with high tensile steel corresponding to ASTM-A- 577 of thickness varying from 32 mm to 60 mm. Each pressure shaft will be made to bifurcate into two branch tunnels of 3.45 m dia. varying in length from 43 m to 65 m near the powerhouse to feed the six generating units inside the powerhouse. Butterfly valve housed in a valve chamber are proposed in the horizontal reach to pressure shafts for repair/maintenance without dewatering the head race tunnel. The six tunnels are made to feed six turbines placed in an underground power house cavern of internal dimension 216 m x 20 m 40 m located 200 m below the natural surface level. The powerhouse will have an arched roof with concrete lining and shall house six generating units each of 250 MW. The water from the turbines are diverted through the six draft tubes to the tail race tunnel (T.R.T.) of 10.15 m dia, with circular cross-section, which carries the water back to the river. The power house cavern is integrated with the transformer cavern of size 198 m x 18 m x 27 m, which also houses an underground SF6 Switch-Gear. Figure gives a cross section of the surge shaft, pressure shaft and the powerhouse. The whole project is situated in the lesser Himalayan zone and comprises the Precambrian meta-sedimentary sequence of the Jutogh formation, overlying the Wangtu gneissic complex, which also forms the basement. The Wangtu gneissic complex was considered to be a part of the Sarahan formation containing the Jutogh formation (Jhingran et. al. 1950 and Tewari et.al., 1978). Kakar (1985, 1988) considers the stratigraphy to consists of a basement of Wangtu gneissic complex, in thrusted contact with Karcham group along the karcham thrust. A summary of the stratigraphy of the area is given in table 1. The topography of the area is extremely rugged and bears a dendritic drainage pattern. Steep gorges formed by the Satluj river and other minor rivulets are also seen. The Satluj river flows at 1460 m above M.S.L. at Nathpa and is fed by the Bhaba, Baspa and Spiti rivers upstream of Nathpa. Lake Mansarover forms the main feeder to this river upstream of Nathpa. Lake Mansarover forms the main feeder to this river system. In general the area exhibits steep slopes due to extensive down cutting by the turbulent water of the Satluj River. Many hanging valleys formed by the various rivulets are also noticed. The general flow direction of the river is east to west which is conformable to the general strike direction of the Himalayas. Interlayeredporphryoblastic aGneiss and Banded 7800 m.
The major rock types of the area are augen gneiss, quartz-biotite schist, amphibolites and some pegmatite lenses at places. Augen gneiss: It is essentially a two feldspar, two mica (mainly biotite) gneiss, with a porphyroblastic texture, which at places are mylonitic. The foliations are defined by the micaceous layers, which flow around the augens. The elongation direction of the augens defines a strong stretching lineation. The shape of the augens varies from nearly round to lensodal at places, showing well drawn out porphyroclast tails. Quartz-biotite-schist: The schistocity has a strong domainal character with well defined quartzose and micaceous layers. The layers are tabular to lensoidal. At places some biotite rich lenses are also seen. Strong stretching lineation on the foliation plane is marked. At places the biotite altering to sericite indicated by crumpling and high fissility is also noticed. Amphibolites: The amphibolites are massive weakly foliated with a prominent amphibole lineation, which appears to be a primary igneous flow structure. The quartz, feldspar content is very low and the rock is especially a biotite rich amphibolite. The amphibolites occur as narrow linear belts in the outcrop and generally unparallel to the foliation of the country rocks except at places they are at an angle to them. Pegmatite: They occur both as concordant and discordant bodies and are commonly associated with the gneisses. These are present as tabular laths or as apophyses. Quartz and feldspar exhibit a graphic texture. They also display two sets of fractures. The main structures present in the area include foliation, lineation, joints folds and shear planes. Lineation: All the rock units have a prominent lineation. In the schists, it is defined by mica alignment and elongation of the quartz grains. In the gneiss, the elongation of the augens defines it. In the amphibolites, it is defined by the alignments of the amphibolite’s grains. Folds: Minor pygmatitic folds along with local open fold are present in the area. Some clear exposures of pygmatic folding in the generosity is seen in an outcrop near Manglad. The style of fold is broad, gentle open fold. Shear Plane: Numerous small-scale shear planes are present throughout the area. The altered horizons consisting of clay and sericite within the rocks are good indicators of shear zones. Shear planes are also marked by rich extensional structures like pinch and swells, boudins and porphyroclast tails of the augens. Pinch and swell structures and boudins: These structures are common and are parallel to the foliation. These are most abundant at the Nathpa dam site. A review of the major folds and faults of the area is given in table 2. The area of the project comes under the seismic zone IV and falls between isoseismal VII and VIII, of the seismic map of India. Ground acceleration is equivalent to 98 to 100 cm/sec2. Earthquakes are sporadic and the strongest earthquake witnessed by the area dates back to April 4, 1905 with its epicenter at 320 – 15'N and 760 15'E, having a magnitude of 8 on Richter scale. They are frequent either in the rainy season or during snowfall in winters. The areas having steep slopes, foliations, and excessive jointing are potential sites for landslides. Landslides are most frequent during the monsoons. The water percolates through the joints and other planes of weaknesses and reduces the coefficient of sliding friction by pore pressure. Thus, a small force or even gravity becomes enough to trigger off a landslide. Other than this even some minor earthquake sometimes triggers off landslides. Another important factor that causes landslides are frost and wedge action in alternate snowfall and dry seasons. This mechanical process shatters the rocks and even a slightest movement makes them vulnerable to sliding. Even the turbulent flow of the river sometimes leads to excessive down cutting leading to slope failure of rocks and thus causes landslides. Apart from these mechanical causes alternation of biotite bands, or swelling of the clay portion within mica due to percolation of water reduces the coefficient of sliding friction, causing sliding. Blasting activities carried on in the area for construction and other purposes also at times triggers of landslides. Not well developed everywhere close spacing resulting in sheeting. Joint spacing can be studied in conjunction with foliation and other structures on a geological wall log, which consists of projections of structures at a given elevation. Such a geological wall log has been prepared for part of a tunnel, designed to be one of the transformer galleries of the Power House Complex. This is one of the essential computations, prior to and during tunneling, to select the right technology, depending on the rock class. The quality of the rocks was assessed for an escape tunnel near the Power House Complex. ..Q = 50 x 3 x 1.0 = 5 which implies of rock. This is done where the rocks have failed in the tunnels, to apply remedial measures commensurate with the strain rate. Stress acts on rock, which is unbalanced to produce strain. The chief reason for the caving in of the crown is the strain produced at the spring line due to the overlying overburden induced stress not balanced by the supporting or casing technology. Extensions of various designs are calculated by employment to tape extensometer in common use because of its accuracy and cheapness. It is employed to calculate the strain rate on a daily basis. i) The most important aspects to be kept in mind while tunneling is the disposition of the tunnel with respect to the foliation and other planar discontinuities which are potential slip structures. ii) The rock quality plays a vital role in deciding the blasting procedure and tunnel support. iii) Overburden plays an important role in deciding the blasting procedure and tunnel support. iv) Seepage and position of the water table need to be considered. If the seepage is temporary, then there is no problem. In case it is permanent, suitable treatment is required. The lithology of the dam site consists of jointed gneisses with lots of shear bands. The clay material is being excavated and the gaps grouted. Finally, the rocks are bolted and shotcreted to consolidate the wall rock. The left bank is less stable as the wall cuts across the foliation joint. There have been instances of slides on the left bank, primarily due to sheet induced slope failure. The reservoir crest is at EL. 1490.50 m and spillway crest is at EL. 1488.00 m. A profile along the dam axis show that the foliation dips towards the abutments along the left bank whereas they dip away from the abutment along the right bank thus suggesting a need for stronger support on the left bank. For constructing the dam, a coffer dam is proposed upstream which is expected to divert the water during off-monsoon season through a diversion tunnel in the right bank, downstream of the dam site, to facilitate construction work. Cable anchors are also being installed which are expected to carry chilled concrete overhead so that they can be dropped at a rate sufficient for the material to remain in the fluid state in the air, which after being dropped will be immediately chilled. Seven edits are opened for construction of the H.R.T. and other important structures mentioned above. A detail of the adits is listed in table 4. Here the rock type is quartz biotite schist with a prominent foliation, attitude 2650/260 – 3550. The mapped face has quartz boudins parallel to the foliation. One set of joints at a high angle to the foliation is present. The tunnel is parallel to the strike of both the foliation and the joint, which is very unfavorable. As such, it is proposed to open the crown first upto the spring level, apply the requisite rock bolts and shortcretes and then open up the tunnel further down up to the invert. The shape of the tunnel will eventually be circular. A portion of the tunnel has caved in, in this part of the HRT, due to overburden. The remedial measure consists of closer rib spacing and use of wider steel ribs. This tunnel has a horseshoe shape design. The tunneling conditions are more favorable, as the foliation plane is the face of the tunnel (figure). As such, the method employed here is slightly different. The invert to spring is first opened up (figure) and supporting pillars are simultaneously raised till the spring level. The spacing of the rib caging is wider here. On the walls traces of foliations appear and hence rock bolting on the walls are closely spaced. Here the overburden is the least, but there is continuous seepage along the crown. Due to low overburden, the stress on the crown is less as compared to that on the walls which gives rise to stability. A steel jacket is proposed to provide support for tunnel in this section (figure). The extensometer is employed to measure rock movement. In this method, a hole is drilled in the wall. A plastic casing job is done on the drilled hole. The instrument is inserted into this casing. The pointed end is anchored in the bedrock. A reference plate is fixed to the rock. The movement of the rock is quantified by readings on this plate. The magnitude and ratio of strain is calculated from this.